The nation's capital is filled with historic, award-winning, chef-owned restaurants specializing in sustainable farm-to-table and locally sourced cuisine, plant-forward and authentic ethnic fare, and neighborhood eateries focused on local favorites. Forget politics, forget history, forget museums—the best reason to visit Washington, D.C., might just be the food. Washington, D.C., is home to 14 Michelin-starred restaurants and one of only four US cities to have its own Michelin Guide (Chicago, New York City, and San Francisco are the others). In 2016, D.C. was named restaurant city of the year by Bon Appétit and hottest food city by Zagat (pronounced ze-GAT). When you're in town for the Food & Nutrition Conference & Expo™ (FNCE®), odds are good that every meal will be memorable, whether you're savoring an Instagram-worthy dish from a celebrity chef or a chili-smothered half-smoke from the historic Ben's Chili Bowl. 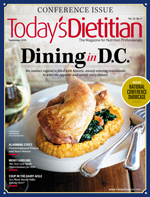 Today's Dietitian asks a team of local food experts and dietitians to offer their views on the best of D.C. dining. "The Washington, D.C., food and dining scene is booming at the moment," says Michael Friedman, chef of The Red Hen and All-Purpose Pizzeria. "I really think the change came about a decade ago, but has slowly snowballed into what it is today." Friedman says it doesn't hurt that people love living in D.C. "There's so much to do—free museums, parks, theater, riverfront views, history, government, and arts all play their role in making D.C. such an attractive city!" The D.C. Chamber of Commerce calls the local dining scene as colorful and eclectic as America itself, and Allison Tepper, MS, RDN, LDN, owner of Allison Tepper Nutrition Consulting and an instructor at American University, agrees. "D.C.'s food scene continues to grow and many different ethnic influences have impacted the array of options, which has been awesome," she says. "The food is high quality and can fit anyone's needs, from restaurants that are kid friendly to high end. The city has a lot of prominent chefs that are always working to create the next best restaurant, food truck, or pop-up location." Appropriately, one of the city's brightest culinary stars, James Beard Award–winning Chef José Andrés, will be speaking at FNCE® about "Changing the World Through the Power of Food" on Monday, October 22. Andrés, chef/owner of the ThinkFoodGroup, is the innovator behind some of the city's best restaurants, as well as a passionate advocate for food and hunger issues. A Taste of History: Classic D.C. While there's much that's new and exciting about the D.C. food scene, it's also worth exploring the city's culinary history. Rob Weland, chef/owner of Garrison (see "Sustainable Farm-to-Table" on page 23), says enjoying Chesapeake Bay blue crabs with a pitcher of beer overlooking the Bay is about as classic as it gets, adding, "I'm developing quite a taste for Old Bay seasoning." But after his shifts, you might find him at Old Ebbitt Grill (http://ebbitt.com, 675 15th Street NW, Washington, D.C., 202-347-4800) enjoying oysters on the half shell. "I'm a traditionalist," he says. Old Ebbitt Grill also makes Tepper's list for fun classic D.C. restaurants to visit. "Ben's Chili Bowl (http://benschilibowl.com, multiple locations, including the original location at 1213 U Street NW, Washington, D.C., 202-667-0058) is also a well-known favorite—though it's quite decadent, so not for the faint of heart!" Tepper says. "Make sure you try Ben's Famous Chili Half Smoke, voted Washington's signature dish." Tepper will be speaking on "Mindfulness as a Critical Component of Nutrition Therapy" at FNCE®. Rebecca Scritchfield, RDN, CEO of Capitol Nutrition Group and author of Body Kindness, who will be speaking on "The Neurobiology of Dieting" at FNCE®, agrees that Ben's Chili Bowl is a must-visit for the historical value and the food. The original location has been an integral part of the neighborhood's history since 1958. Both the police and protesters frequented the restaurant during the 1968 riots. In January 2009, Washington, D.C., Mayor Adrian Fenty took then President-elect Barack Obama to eat at Ben's as part of his welcome to the city. For truly historical cuisine, Charmaine Jones, MS, RDN, LDN, owner of Food Jonezi, recommends Georgia Brown (http://gbrowns.com, 950 15th Street NW, Washington, D.C., 202-393-4499). The restaurant's fine southern cuisine draws from the diverse culinary history of the Virginia lowlands, including West Africa and Barbados as well as the influence of Native Americans, the French Huguenots, and Sephardic Jews from Portugal and Spain. D.C. has no shortage of restaurants that merge delicious and nutritious in plant-forward menus. An easy entry to the Andrés food universe is Beefsteak (http://beefsteakveggies.com, 1528 Connecticut Avenue NW, Washington, D.C., 202-986-7597), where farm-fresh vegetables are the star. They're matched with grains, freshly made sauces, and flavorful toppings—including a few animal-based options—to create customized bowls and salads. Download the Beefsteak app to order ahead and skip the line. Chaia (www.chaiadc.com, 3207 Grace Street NW, Washington, D.C., 202-333-5222) is a "farm-to-taco" restaurant offering seasonal, plant-based tacos on hand-griddled corn tortillas. You'll find a Latin-American slant at Royal (www.theroyaldc.com, 501 Florida Avenue NW, Washington, D.C., 202-332-7777). This coffee shop by day, bar/kitchen by night, offers many vegan and vegetarian options, with interesting takes on everything from breakfast sandwiches to the popular grilled avocado, which sits on top of lentils and red quinoa with house vinaigrette. Travel weary? Fare Well (www.eatfarewell.com, 406 H Street NE, Washington, D.C., 202-367-9600) offers veggie-centric comfort food, including a dairy-free burrata house-made from cashews and almonds, dressed up with arugula pesto, balsamic marinated tomatoes, arugula, capers, and a toasted baguette. For contemporary American comfort food, turn to Firefly (www.firefly-dc.com, 1310 New Hampshire Avenue NW, Washington, D.C., 202-861-1310), which offers several vegan, vegetarian, and gluten-free options (although it's not a fully gluten-free facility). Favorites like crab cakes, and their signature pot roast, use seasonal, local ingredients. When at FNCE®, narrowing down options for dinner is one thing—finding anywhere to grab a quick, tasty lunch that doesn't make you crave an afternoon nap is another. Fortunately, there's a bumper crop of nutritious "fast food" near the convention center. HipCityVeg (http://hipcityveg.com, 712 7th Street NW, Washington, D.C., 202-621-8057) has a vegan, fast food-inspired menu using fresh, often local, and organic ingredients. They also have breakfast options, as does Fruitive (https://fruitive.com, 11th Street NW and Palmer Alley, Washington, D.C., 202-836-7749), which is certified organic and 100% plant-based, offering juices, wraps, sandwiches, salads, toasts, and collard tacos. Want to go Med? The D.C.-based chain Cava (http://cava.com, multiple locations, including 523 H Street NE, Washington, D.C., 202-459-4677) has build-your-own Mediterranean-style bowls, salads, and pitas with options for vegans and carnivores alike. They accept online orders with their own app to make it easier. Sweetgreen (http://sweetgreen.com, multiple locations, including 1065 5th Street NW, Washington, D.C., 202-289-4674), another D.C.-based chain, also has an app, along with salads and bowls using seasonal ingredients with an emphasis on locally sourced ingredients. Choose one of their tasty combos, or build your own. They also have vegan options. At honeygrow (http://honeygrow.com, multiple locations, including 716 7th Street NW, Washington, D.C., 202-804-4282), you also can build your own salad or stir-fry. "You won't find a freezer in our stores, and if we can buy it locally, we do it," says the website. All sauces and dressings are made in-house daily. "The Mid-Atlantic region is diverse in terms of its agriculture, so restaurants have access to a wide variety of seasonal produce and other products," Scritchfield says. "And this is a city where chefs have very close relationships with farmers and producers, so menus change a lot and are really interesting." Three of her favorites are Rappahannock Oyster Bar (www.rroysters.com/restaurants, 1309 5th Street NE, Washington, D.C., 202-544-4702) at Union Market; Convivial (www.convivialdc.com, 801 O Street NW, Washington, D.C., 202-525-2870), an American café with French flair; and Chaia (mentioned earlier under "Putting Plants Forward"). According to Scritchfield, "All three employ sustainable philosophies when it comes to the ingredients they grow and/or source." Tepper is a fan of Farmers Fishers Bakers (www.farmersfishersbakers.com, 3000 K Street NW, Washington, D.C., 202-298-8783) in Washington Harbour. "This restaurant is known for its farm-fresh food, and it is amazing," Tepper says. "I will typically recommend this restaurant for people coming from out of town." Farmers Fishers Bakers, along with Founding Farmers (www.wearefoundingfarmers.com, 1924 Pennsylvania Avenue NW, Washington, D.C., 202-822-8783) and Farmers & Distillers (https://farmersanddistillers.com, 600 Massachusetts Avenue NW, Washington, D.C., 202-464-3001) are majority owned—as well as sourced—by the more than 47,000 family farmers of the North Dakota Farmers Union. Hearth cooking is hot, as evidenced by A Rake's Progress (www.thelinehotel.com/dc/venues, 1770 Euclid Street NW, Washington, D.C., 202-588-0525), where James Beard Award–winning Chef Spike Gjerde cooks what he sources from Mid-Atlantic farms and waters in a large, wood-fired hearth. The Dabney (https://thedabney.com, 122 Blagden Alley NW, Washington, D.C., 202-450-1015), Chef Jeremiah Langhorne's Michelin-starred restaurant, displays some of the most aggressive commitment to local sourcing and Mid-Atlantic cuisine in the region, according to Eater, a website that provides food news, restaurant reviews, and dining guides from across the country. As a result, the menu—including hearth-roasted vegetables—rotates frequently. 1789 (http://1789restaurant.com, 1226 36th Street, NW, Washington, D.C., 202-965-1789) was farm-to-table before it was cool, according to Eater; 1789 and sister restaurant Old Ebbitt Grill (mentioned earlier under "A Taste of History: Classic D.C.") have consistently used straight-from-the-farm ingredients for decades. They also grow herbs and vegetables on their own terrace, and an open kitchen featuring a wood-fired stove turns out dishes based on historic regional recipes. At Equinox (www.equinoxrestaurant.com, 818 Connecticut Avenue, NW, Washington, D.C., 202-331-8118), Chef Todd Gray offers sophisticated cuisine that's been called "Eastern Seaboard-meets-European" fare. His mission is to use community-sourced, organic ingredients grown within 100 miles of the restaurant whenever possible. Eater says that in recent years, Gray has even raised cattle and caught fish for the restaurant. The menu includes a plant-based tasting menu and vegan à la carte items. Blue Duck Tavern (http://blueducktavern.com, 1201 24th Street NW, Washington, D.C., 202-419-6755) is the only place in D.C. where you'll find a breakfast worthy of a Michelin star. The restaurant serves three meals per day and features seasonal fare cooked in an open kitchen. At this fine American, yet unpretentious, restaurant—apple pie is its signature dessert—all produce and everything from eggs to crabs (in season) is locally sourced. The Michelin Guide calls Weland's cuisine at Garrison (www.garrisondc.com, 524 8th Street SE, Washington, D.C., 202-506-2445) "ramped-up American," and points out that area farms dictate the menu, so note the handwritten daily specials. Weland says his philosophy—exemplified by most of his menu—is "Keep it simple. Buy amazing, fresh food from farmers who care, and let the product shine and speak for itself." For example, when heirloom tomatoes are in season, he serves them simply sliced and served with high-quality olive oil, sea salt, and herbs, then topped with fresh watermelon sorbet. Bidwell (http://bidwelldc.com, 1309 5th Street NE, Washington, D.C., 202-547-0172) offers creative, naturally sourced American food with vegan and gluten-free options. Signature dishes include gin & tonic salmon and lobster tacos. Much of Bidwell's produce comes from fruits and vegetables grown in aeroponic planters on the roof of Union Market—literally roof-to-table cuisine. Sally's Middle Name (http://sallysmiddlename.com, 1320 H Street NE, Washington, D.C., 202-750-6529) offers comfort foods with a fresh, inventive twist using seasonal, sustainably sourced produce. The menu changes daily. "We really have a cosmopolitan atmosphere in the city. So many cultures from so many different countries are coming together every day due to the government presence," Friedman says. "We've always had an ethnic presence when it comes to food as well, so it's nice to see those cuisines come to the forefront on such a large stage." He says a must-taste food experience in D.C. is Ethiopian food: "We have the best. It's unique, and so distinct—it should not be missed." A prime example is Chercher (www.chercherrestaurant.com, 1334 9th Street NW, Washington, D.C., 202-299-9703), which has been recognized as a Bib Gourmand by Michelin. The Washington Post calls Ethiopic (www.ethiopicrestaurant.com, 401 H Street NE, Washington, D.C., 202-675-2066) "a refined spot for a refined take on Ethiopian plates." Craving Indian food? Tepper recommends Rasika (www.rasikarestaurant.com, 633 D Street, NW, Washington, D.C., 202-637-1222). "If you are an Indian food lover, this place is for you," she says. "It's one of the most well-known Indian restaurants in the city. If you go, make reservations ahead of time and make sure to order their signature dish, the palak chaat." James Beard Award–winning Executive Chef Vikram Sunderam's cookbook debuts October 10. Bon Appetit named Bad Saint (www.badsaintdc.com, 3226 11th Street NW, Washington, D.C., info@badsaintdc.com), the 24-seat "passion project" co-owned by Filipino-American chef and James Beard Award finalist Tom Cunanan, the No. 2 best new restaurant for 2016. "Bad Saint is the kind of place I spend all year searching for," according to the reviewer. Offerings range from grilled pork to curry-soaked vegetables to noodles cooked with crab fat. Walk-ins only, no parties larger than four. That's also the case at Himitsu (http://himitsudc.com, 828 Upshur Street NW, Washington, D.C., carlie@himitsudc.com), which offers fresh Japanese-inspired cuisine with Southeast Asian and Latin American flavor profiles. This creativity helped earn them a spot on Eater's and Bon Appetit's best new restaurants lists for 2017. In the mood for Italian? Head to Friedman's The Red Hen (www.theredhendc.com, 1822 First Street NW, Washington, D.C., 202-525-3021) or All-Purpose Pizzeria (http://allpurposedc.com, two locations, including 1250 9th Street NW, Washington, D.C., 202-849-6174), his ode to Italian-American food. "My culinary philosophy is this: Make it simple and make it delicious," Friedman says of his restaurants. "That's it. Crave-worthy food is hard to come by, and that's the wheelhouse I live in." Two dishes that exemplify his culinary philosophy are Red Hen's mezzi rigatoni with fennel sausage ragu and All-Purpose's Buona Pizza with tomato, mozzarella, pepperoni, basil, and chili honey. Shouk (www.shouk.com, 655 K Street NW, Washington, D.C., 202-652-1464; 395 Morse Street NE, Washington, D.C., 202-313-7671) has a plants-only menu of modern Israeli street food, with a veggie burger that wins raves, including from The Washington Post, which named Shouk 2018's best fast casual restaurant. Lapis Afghan Bistro (www.lapisdc.com, 1847 Columbia Road, NW, Washington, D.C., 202-299-9630), a recipient of Michelin's Bib Gourmand designation, is the place to go for modern Afghan cooking, featuring homestyle dishes cooked with local seasonal ingredients, using family recipes passed down from generations. The menu includes lots of vegetarian options, plus standout kebobs. Andrés began his D.C. restaurant empire with Jaleo (www.jaleo.com, 480 7th Street NW, Washington, D.C., 202-628-7949), where "the space is as fun as the food is serious," according to The Washington Post. Jaleo features sharable small plates of authentically Spanish and local ingredients, simply prepared, inspired by the traditional dishes of Andrés' childhood. At China Chilcano (http://chinachilcano.com, 418 7th Street NW, Washington, D.C., 202-783-0941), Andrés' unique take on contemporary Peruvian cuisine celebrates the country's culinary diversity, with its Chinese, Spanish, West African, and Japanese influences. Woodward Table and Woodward Takeout Food, also known as WTF (http://woodwardtable.com, 1426 H Street NW, Washington, D.C., 202-347-5353), includes some appealing vegan and vegetable-forward options. The main restaurant, with its open hearth, offers a creative and diverse American menu that features house-made charcuterie and a roasted cauliflower steak entrée with farro. WTF offers artisanal eat-in or takeout alternatives for breakfast and lunch, including soups, creative sandwiches, and fresh market salads—such as a "grains and greens" salad. Retro throwback Ted's Bulletin (www.tedsbulletin.com, 1818 14th Street NW, Washington, D.C., 202-265-8337) puts a twist on American favorites in an upscale luncheonette setting. "This restaurant has delicious food with a D.C. vibe," Tepper says. "They are well known for their homemade pop tarts." Call ahead a few hours before you plan to arrive to put your name on the waitlist. At Central (www.centralmichelrichard.com, 1001 Pennsylvania Ave NW, Washington, D.C., 202-626-0015), a James Beard Award–winning modern American bistro with a French twist, Chef Michel Richard makes fine dining welcoming and accessible. Food & Wine called Logan Circle staple Birch and Barley (http://birchandbarley.com, 1337 14th Street NW, Washington, D.C., 202-567-2576) "a bistro with the heart of a beer bar." Find elevated, market-driven New American fare, all designed to pair with the 555 beers offered. Or just go upstairs to sibling ChurchKey, an award-winning craft brew bar. There are 14 restaurants in Washington, D.C., that have earned Michelin stars. Along with The Dabney and Blue Duck Tavern (mentioned earlier under "Sustainable Farm-to-Table"), these stars include Sushi Taro (www.sushitaro.com, 1503 17th Street NW, Washington, D.C., 202-462-8999), often called the city's finest sushi restaurant, and Plume (www.plumedc.com, 1200 16th Street NW, Washington, D.C., 202-448-2300), which serves New American fare inspired by Thomas Jefferson's gardens at Monticello, prepared by German-born Chef Ralf Schlegel. Take a multicourse journey through the world of molecular gastronomy with an imaginative and progressive tasting menu at Andrés' minibar (www.minibarbyjoseandres.com, 855 E Street NW, Washington, D.C., 202-393-0812). Or, for a tasting menu highlighted by Mediterranean seafood, which The Washington Post calls "impeccable," visit James Beard Award–winning Chef Johnny Monis' Greek-inflected Komi (http://komirestaurant.com, 1509 17th Street NW, Washington, D.C., 202-332-9200). Still interested in tasting? Chef/owner Aaron Silverman's elegant yet playful approximately 12-course tasting menu at Pineapple and Pearls (www.pineappleandpearls.com, 715 8th Street SE, Washington, D.C., 202-595-7375) has been called "the stuff of perfection." Silverman splits his time between Pineapple and Pearls and the open kitchen at neighbor Rose's Luxury (www.rosesluxury.com, 717 8th Street SE, Washington, D.C., 202-580-8889), named for Silverman's grandmother. Bon Appétit named it the best new restaurant in America in 2014. Oh, and former President Obama celebrated his 54th birthday there. The menu is small plates–centric. No reservations. Scritchfield's top picks are Masseria (www.masseria-dc.com, 1340 4th Street NE, Washington, D.C., 202-608-1330) and Kinship (www.kinshipdc.com, 1015 7th Street NW, Washington, D.C., 202-737-7700). "Both places are chef owned and produce extraordinary food," she says. "Both chefs trained under Thomas Keller, and their food and service are outstanding." Located near Union Market, Nicholas Stefanelli's Masseria draws from his childhood roots in Italy's Puglia region, offering coastal cuisine cooked to perfection. After getting his start at Keller's The French Laundry, Chef Eric Ziebold moved to D.C. and opened Kinship—Washingtonian magazine's 2018 pick for best restaurant—to rave reviews. Menu items are arranged by culinary themes that celebrate the diverse influences that have shaped American cuisine. Located beneath Kinship, an even more indulgent experience awaits at Métier (http://metierdc.com, 1015 7th Street NW, Washington, D.C., 202-737-7500), Ziebold's ambitious 36-seat French-themed restaurant with a seven-course tasting menu. At Fiola (www.fioladc.com, 601 Pennsylvania Avenue NW, Washington, D.C., 202-525-1402), Chef Fabio Trabocchi offers tasting menus that draw inspiration from regional Italian classic dishes and family traditions, using local, seasonal ingredients. You also can dine à la carte at the bar, in the lounge, or on the patio. The restaurant has an à la carte lunch menu. Trabocchi's other restaurants include downtown D.C. pasta house Casa Luca (www.casalucadc.com, 1099 New York Avenue NW, Washington, D.C., 202-525-1402). Mediterranean flavors also permeate the menu at Tail Up Goat (www.tailupgoat.com, 1827 Adams Mill Road NW, Washington, D.C., 202-986-9600). "The food here is delicious and incredibly unique without going overboard," Tallman says. Enjoy everything from goat lasagna and house-baked breads to hearty veggie-friendly fare. • 14th Street. "14th street is an area of D.C. that has a really interesting history," says Anne Mauney, MPH, RD, owner of fANNEtastic food. "Fifty years ago it was literally burning in riots, and now it's one of the trendiest, hippest areas of D.C. with an amazing food scene." • H Street. This NoMa (North of Massachusetts Avenue) neighborhood is home to Union Market (https://unionmarketdc.com, 1309 5th Street NE, Washington, D.C., 301-347-3998), a recently reinvented gourmet food hall. "It's great to walk around and explore all the local food options, and to get lunch," Mauney says. A few of Jones' picks reside here, including Sospeso (www.sospesodc.com, 1344 H Street NE, Washington, D.C., 202-594-3517) with cuisine inspired by the Mediterranean and North Africa, and Stable (www.stabledc.com, 1324 H Street NE, Washington, D.C., 202-733-4604), which fuses Swiss and American cuisines. • Dupont Circle. "It's really fun to walk around and explore because it's all cute tree-lined streets with beautiful old row houses, and there's tons of great food options," Mauney says. • Capitol Hill. Mauney suggests exploring the Eastern Market (http://easternmarket-dc.org, 225 7th Street SE, Washington, D.C., 202-698-5253) area for great food and more historic row houses. • Adams Morgan. Centered at 18th Street and Columbia Road, this multicultural neighborhood has eclectic bars, music venues, and international restaurants from Vietnamese to Ethiopian, plus late-night pizza and falafel spots. • Shaw. Scritchfield likes this neighborhood, immediately north of the convention center, for the previously mentioned All Purpose, Convivial, and The Dabney, as well as trendsetting Maydan (http://maydandc.com, 1346 Florida Avenue NW, Washington, D.C., 202-370-3696), Buttercream Bakeshop (https://buttercreamdc.com, 1250 9th Street NW, Washington, D.C., 202-735-0102), Hong Kong-inspired Tiger Fork (www.tigerforkdc.com, 922 N Street [rear], Washington, D.C., 202-733-1152), and Hazel (http://hazelrestaurant.com, 808 V Street NW, Washington, D.C., 202-847-4980). • The Wharf (www.wharfdc.com). This is one of D.C.'s newer exciting multiuse developments.